Hubble touches people. When you're looking that far out, you're giving people their place in the universe, it touches people. Science is often visual, so it doesn't need translation. It's like poetry, it touches you. 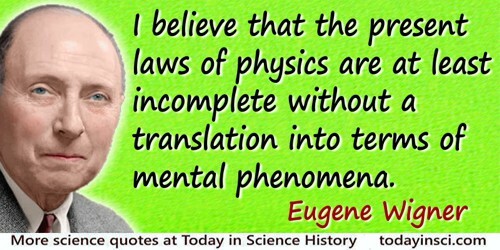 I believe that the present laws of physics are at least incomplete without a translation into terms of mental phenomena. In 'Physics and the Explanation of Life', Foundations of Physics 1970, I, 35-45. In How to Solve It: A New Aspect of Mathematical Method (2004), 174. Although often seen, these are (almost certainly) not Kant’s own words. While explaining Kant’s ideas, this are the words used by Will Durant in 'Kant and German Idealism: Transcendental Analytic', The Story of Philosophy (1924, 1938), 295-296. 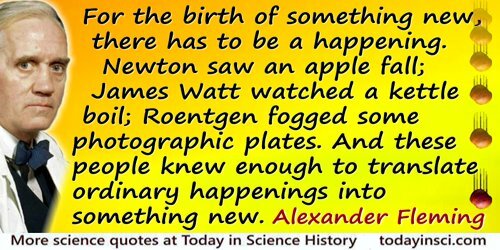 The first sentence, “Science is organized knowledge,” was first stated by Herbert Spencer in 1854 (see Science Quotes by Herbert Spencer.) On the webside of quoteinvestigator.com, which pinpoints Durant as the origin of the quote, it is further explained that Kant’s writing style used complicated expression that makes it rare to find intelligible direct quotes of Kant’s own words. Other translations vary. Sometimes seen quoted more briefly as: The voice of the dolphin in air is like that of the human in that they can pronounce vowels and combinations of vowels, but have difficulties with the consonants. The laws of light and of heat translate each other;—so do the laws of sound and colour; and so galvanism, electricity and magnetism are varied forms of this selfsame energy. In 'Letters and Social Aims: Poetry and Imagination', Prose works of Ralph Waldo Emerson (1880), Vol. 3, 198. The original Greek is of great use in elucidating Browning’s translation of Agamemnon. As quoted, without citation, in William Reville, 'The Science of Writing a Good Joke', The Irish Times (5 Jun 2000). Webmaster has not yet found a primary source. Can you help? To Monsieur Lavoisier by appointment. Madame Lavoisier, a lively, sensible, scientific lady, had prepared a dejuné Anglois of tea and coffee, but her conversation on Mr. Kirwan’s Essay on Phlogiston, which she is translating from the English, and on other subjects, which a woman of understanding, that works with her husband in his laboratory, knows how to adorn, was the best repast. Entry for 16 Oct 1787. In Arthur Young, Travels in France During the Years, 1787, 1788 and 1789 (1792), 64. You may translate books of science exactly. ... The beauties of poetry cannot be preserved in any language except that in which it was originally written. Quoted in James Boswell, The Life of Samuel Johnson, LL.D. (1826), Vol. 3, 29.